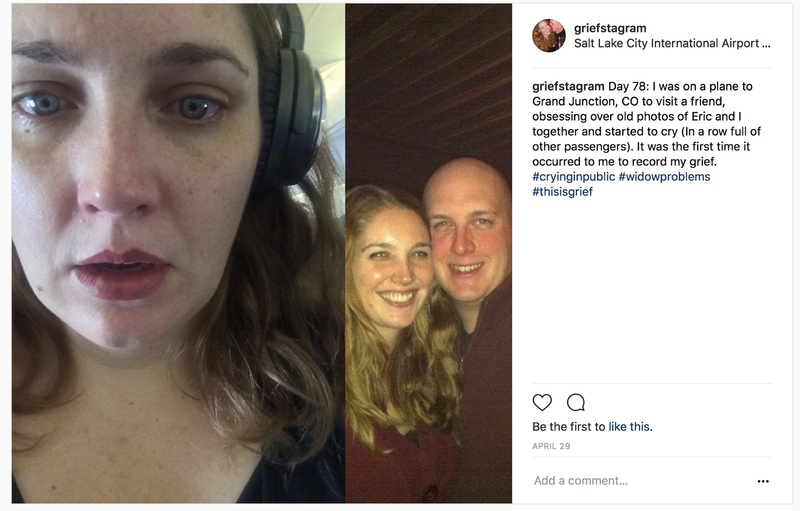 An introduction to @Griefstagram, a project using social media to chronicle my unrelenting roller coaster of grief after the death of my 32 year old husband. Can a Facebook or blog post serve as an obituary? Why is my dead husband trying to connect with me on LinkedIn? What is the opposite of FOMO? These are questions I had never even pondered, but when my husband died last year I was not only faced with traditional issues like when to hold a memorial or what to do with his clothes, but I needed to figure out how to share and mourn his death in the other world he lived in, the internet. 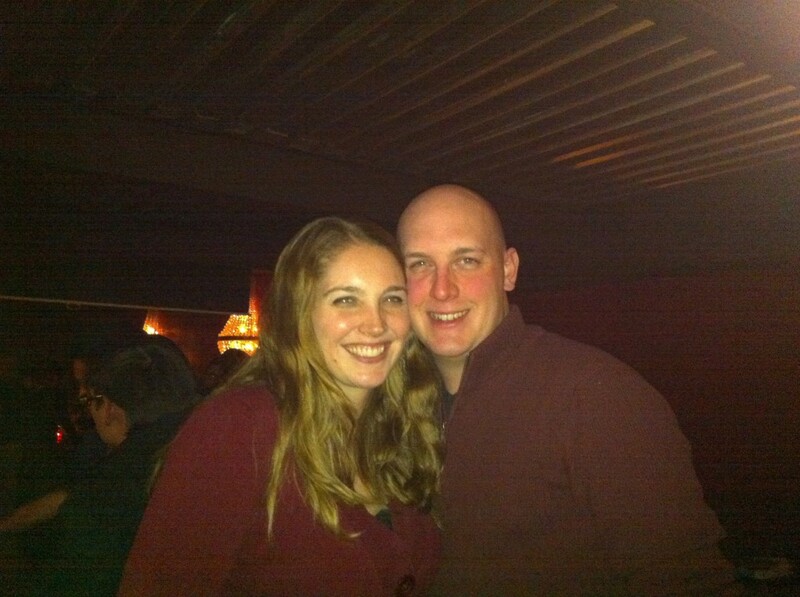 Eric and I at the bar where we had our first date, a few months later in January 2011. I think this is our first picture together. I found it on his phone when he was in the hospital. I had never seen it, but I absolutely love it. My husband Eric was just a small profile picture and a mediocre opening line when we found each other on a dating website in 2010. We quickly decided to meet in person at one of DC’s most popular beer bars, to see if we looked like our pictures. Two profile pictures walked into a bar, and two real people walked out together. 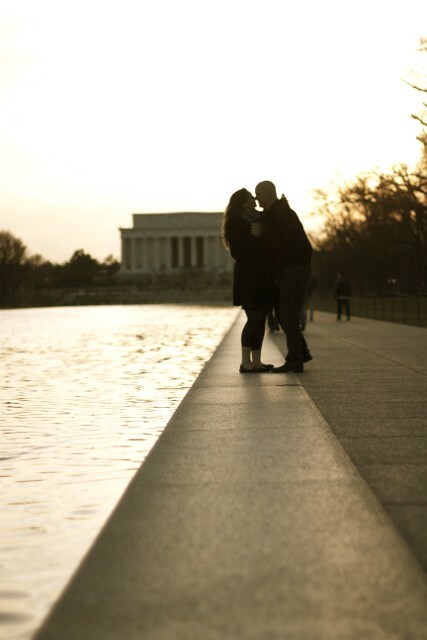 When we got engaged in 2012, I COULD NOT WAIT to share the news on social media. But when Eric died four years later, I could and did wait to share that information online. In fact, I was incredibly apprehensive at the thought. Codifying his death in print and sharing the news with everyone we ever met somehow made it even more real, creating thousands of witnesses to our very personal tragedy. Eric and I had both come of age in the era of AOL Instant messenger, iPhones and Facebook. We had chosen to stay connected to friends, family, co-workers and acquaintances from every period of our lives online. Through the things we chose to share and say online, we had created an entirely incomplete image of ourselves as politically engaged, care-free urban professionals zipping through the world hand-in-hand with two adorable dogs at our sides. Those images of us eventually became more like carefully selected avatars representing us on screen. Posting about Eric’s death online meant killing those avatars. They represented an authentic part of ourselves, but it was not the whole story. Our online selves edited out vast portions of our real lives where he struggled, and I struggled and we struggled together, to get him to a healthier place. 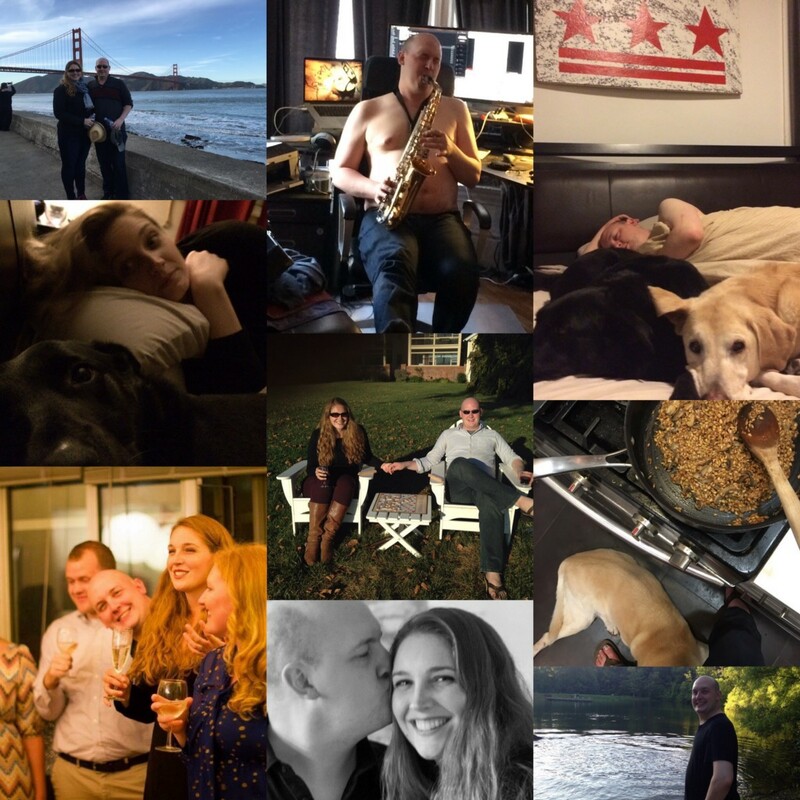 In the end, I had to send the news out in to the world that the kind and intelligent husband, brash pop culture critic, journalist, dog lover and all purpose tech guy, had such a serious battle with alcohol that it took his life at the age of 32. In terms of sharing heart-breaking, life-shattering news, social media turned out to be far more efficient than the town crier or an obituary in the local paper. A single Facebook post spread the news of his passing in a matter of hours. The news of his death showed up on (conservative estimate) 25,000 news feeds around the world. I had been nervous about sharing the news of his death, and the cause, but the response to my post about Eric’s death was overwhelmingly beautiful and celebratory of his life. In the frenzy of condolences and comments after the post, more than a dozen people reached out to me privately to tell me about their struggles with alcoholism or the struggles of their close family members and thanked me for being honest. The reactions made me feel that sharing the news and being open about the cause on a public forum was the right thing to do. I felt the power in being open: the power to remove some of the stigma from alcoholism by refusing to be silent about it and later the power to help demystify grief and loss, and the power to show my immense love for Eric and our complicated life together in the public sphere. That potential to connect is why I am choosing to share deeply personal thoughts and photos through @Griefstagram. In the days and weeks after his death, I became so grateful for the large amount of data about Eric and our life together stored in the cloud. With the advent of the camera phone and the (much lamented) millennial impulse to overshare, many of our more quotidian but happy moments have been captured online for posterity. After his death, I scrolled through every picture he and I ever posted online and was comforted by all the images of the joyful times we had together before alcoholism took over our lives. I had not consciously created the disparity between our digital personas and our lives in the default world, but the vast divide between the two began to fill me with misery. So many great photos captured on our phones, our life backed up in the cloud. 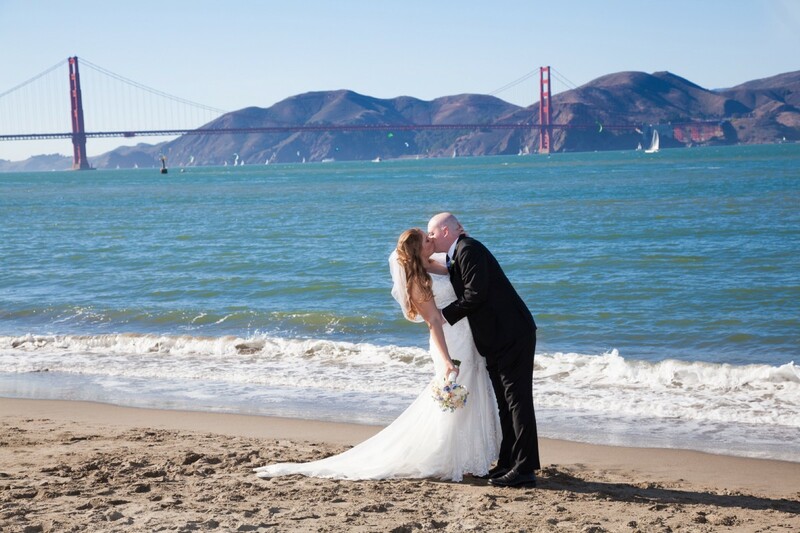 We had loved sharing our better moments with friends online, but the hard times that followed were just as memorable as the good times, and even more beautiful and compelling evidence of our love than an album full of perfectly posed wedding photos. I was not intentionally withholding the harder truths of our life from our online community. Once I realized how serious his problem was, it never once occurred to me to share about it online the way I have developed an impulse to share interesting articles or travel selfies. I figure that we have all tacitly agreed to let social media be place of positivity, a feel-good digital cocktail party where we trade vacation photos and kvetch about politics. Intellectually, I think we all know that social media is a paper-thin slice of a person’s life. But recent research has shown that the positivity and carefully selected images we post online actually contribute to depression in others. I will certainly admit to feeling jealous when I scroll through my newsfeed and see my peers buying homes and having children. I definitely have FOMO. I will also admit to having cherry-picked amazing moments and pleasing angles to broadcast my best possible self to the world. I know no one’s life is as good as it looks, or as perfect as an elegantly photographed dinner party all the time, but the superficial nature of social media has made my public self feel like a stranger in my everyday life. I genuinely want to share the fun and big moments in my life with my friends online. I think that is a fairly common feeling and not meant to make people I went to high school with think my life is better than theirs. But, the images we chose to share have power. They create a shared memory with our online community and they mold a carefully composed version of self and display it in the most flattering light, which often does not match the real thing. A Facebook post is usually the equivalent of running into your mom’s friend in the grocery. But there is an opportunity to be more forthcoming and honest about the things that truly occupy our days and our minds. I have become very conscious of the way I portray myself online. I changed my profile pictures and went dark online for awhile after Eric died. But eventually a couple of happy photos of me (out with my family for my birthday, relaxing on a trip in Colorado) showed up online. Those photos capture moments of authentic joy, but they project an unrealistic image of my life to the world. I am still grieving, desperately sad and lost, just hoping for a few hours of sleep and a day without tears or paperwork. Those images do not show how much I truly loved Eric or grieve his passing, which are the main activities in my life right now. Having a blast, for a moment, in Colorado. 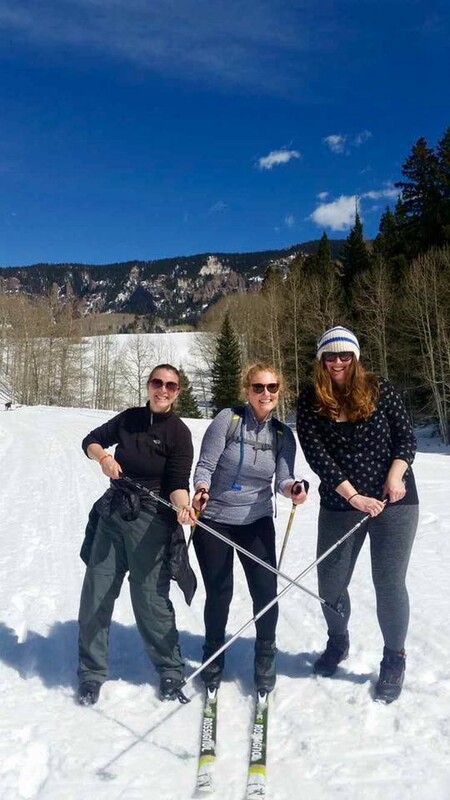 In addition to having #Allthefeels all day long, widowhood has also included me trying some fun and new things like cross-country skiing for the first time, but it was only the fun images that showed up of me online. I am relieved that widows are no longer culturally proscribed to stay in the house or wear black for a set amount of time, but that does make it harder for others to know that I am grieving. As I sit and observe the difference between my real life and online life, I can no longer live with the dissonance between what people see and how I truly feel. I do not expect, nor do I necessarily want, my news feed to suddenly be full of hardships and brutal honesty. I do think that having fomented FOMO in others, and having suffered from it myself, it is worthwhile to try and strike a blow against the emotional tyranny of the perfect photo. The few images I had seen of grief in the media strongly influenced my experience of it in the early days. Before my husband’s death, I had mostly learned about grief from the movies: characters crying into a pile of clothes (which I have absolutely done), laying flowers on a grave (not yet), sending knowing looks up to the heavens (nope) and then, feeling at peace (definitely not). I had seen friends and family members grieve at funerals, but what happened later I never saw. I now know I did not understand grief all. Not knowing what grief really looked like made all of my actions and emotions feel just plain wrong. I have learned that grief is so much more complicated, subtle and variable than I ever thought. Grief has its moments of feeling therapeutic, and grief has its moments of smashing your already mangled and broken heart into even tinier pieces. It’s a journey; it’s a process; it’s a real motherf*****. As a thoroughly modern, millennial widow, I turned to the crowd-sourced wisdom of the internet to find resources on grief. I connected with other widow/ers online. I listened to podcasts and read poems and inspirational quotes (do a google images search on grief, that is what you will find). I discovered that there is a #grief, a #widowproblems and a Grief section on Huffpo. I read Sheryl Sandberg’s thoughts on the subject and laughed and cried with Patton Oswalt’s take on grief. As part of my campaign to read and listen my way through grief, I discovered the “Terrible, Thanks for Asking” Podcast. The narrator, Nora McInerny, is a great writer and funny fellow young widow. The first episode does a wonderful job of explaining some of the complexities of grief and introduced me to a few key concepts that really made me think about grief differently. She said that grief was the evidence that someone was there and that they were loved (YES). She said that a grieving person can laugh and smile and still feel like they were bleeding to death internally (WORD). She said that grief was almost impossible to perform or demonstrate for others and joked that it is NOT the type of thing a person can Instagram. The episode got me thinking (and feeling) a lot. Is grief the type of thing you can Instagram? Grief is far more difficult to show than brunch or new shoes. Artist @mariandrew does a wonderful job of addressing grief in her instagram feed. Grieving is difficult to show because it is not just crying (although there is a lot of crying). It is a self that is changing, dramatically, in real time; an ecosystem struggling to function without water or sunlight. Needless to say, that internal struggle is difficult to capture in photos. But given how social media invites us to share often and over time, in a way it is ideal to chronicle such a long and complex process. I am apprehensive about being vulnerable and honest on a platform where what I post can be commented on, shared and interpreted by anyone. But I think there is value in attempting to bring the digital and default worlds a little closer together and to try and show what my grief looks like in case there is someone out there who needs to see it. 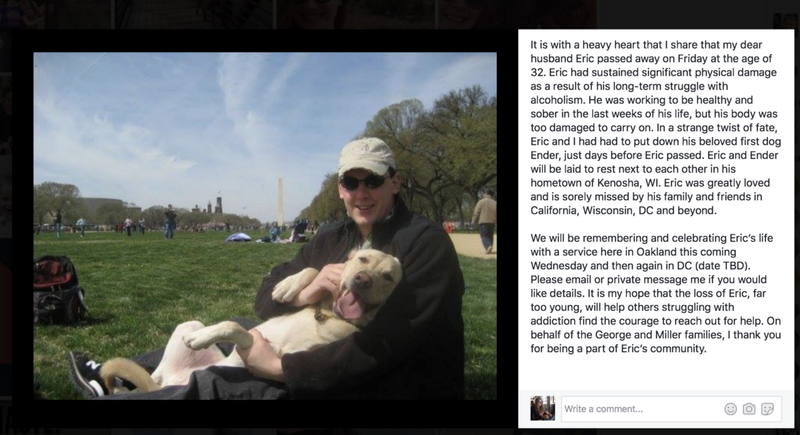 I want to honor the space in the world where Eric should be and I want to be honest about my experiences so that others struggling with alcoholism or grief may feel slightly less alone. It went against all of my instincts to take that first picture of myself crying. It was neither happy, nor joyous, nor enviable, but it was beautiful. A small photo hoping to make the leap off the screen and mean something in the real world. I started taking photos of my grief on day 78. I wish I could have captured the earlier days, but it is too late now. @Griefstagram is my attempt show a more balanced view of my life online, an unvarnished look at the complexity of my grief and the devastating effects of alcoholism. It is a tribute to Eric, who made an indelible mark on my life and on this world (online and off).